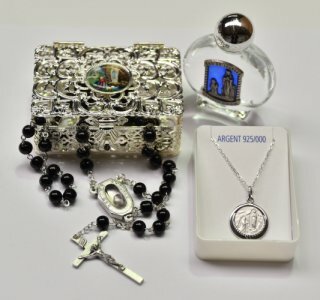 DIRECT FROM LOURDES - Rosary Gift Set with Lourdes 925 Sterling Silver Necklace. Rosary Gift Set with Lourdes 925 Sterling Silver Necklace. > Glass black round rosary beads with a Lourdes water centerpiece that depicts the scene of the apparitions. This rosary is approx 18 inches long.